Duncan Weir started his rugby with Cambuslang at Primary 2 level and went through the ranks to play senior rugby for Glasgow. However, Duncan decided to concentrate on rugby and has not looked back since. He has represented Scotland at U17, U19, U20 and A team level, competing in the IRB Junior World Championship in 2010 and 2011. 2010 also saw him represent Scotland 7s in the Wellington and Las Vegas tournaments before ending the year by signing his first professional contract with Glasgow Warriors. 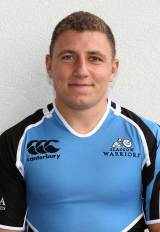 The 2009/10 season saw him play his club rugby for Glasgow Hawks, train as a member of Scottish Rugby's National Academy and studied for an HND in coaching at Cumbernauld College before he was promoted from the Scotland u19 squad up to the u20s. Weir then advanced up the ranks once more to travel with the U20s to the IRB Junior World Championship in Argentina following Alex Blair's selection for the IRB Nations Cup in Romania (Scotland A). And after impressing for Glasgow in both the PRO12 and the Heineken Cup during the 2011-12 season, Weir did enough to earn a call up to Andy Robinson's 30-man squad for the 2012 Six Nations.